By Agung Utama.  A company cannot serve all customers in a broad market  The customers are too numerous and diverse in their buying requirements  A. 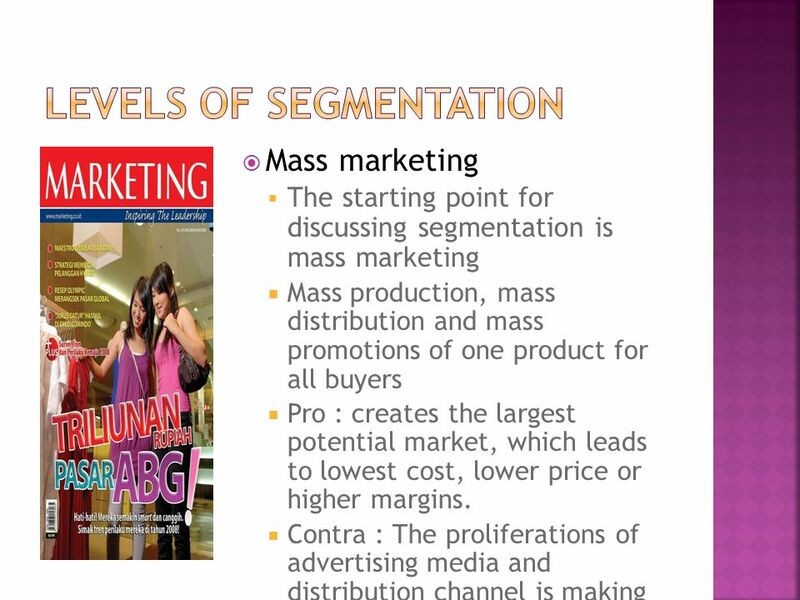 3  Mass marketing  The starting point for discussing segmentation is mass marketing  Mass production, mass distribution and mass promotions of one product for all buyers  Pro : creates the largest potential market, which leads to lowest cost, lower price or higher margins.  Contra : The proliferations of advertising media and distribution channel is making it difficult and increasingly expensive to reach a mass audience. 5 2. 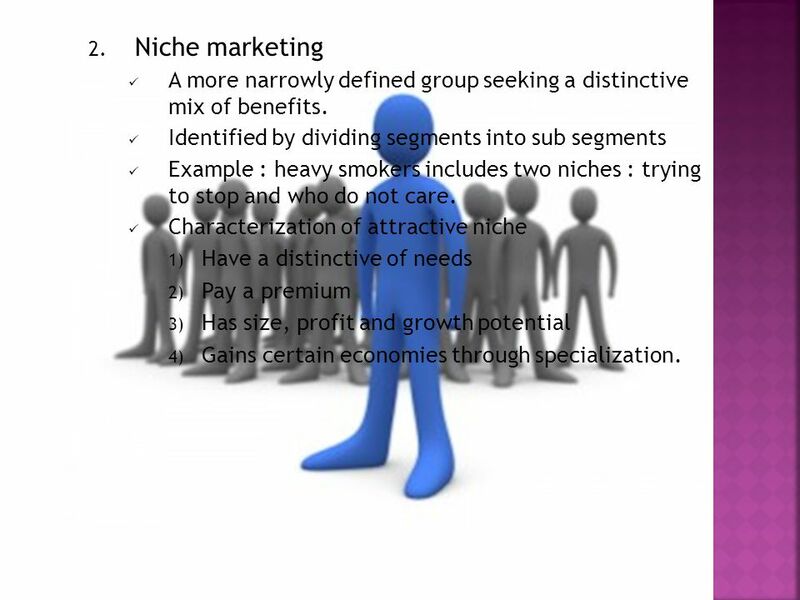 Niche marketing A more narrowly defined group seeking a distinctive mix of benefits. 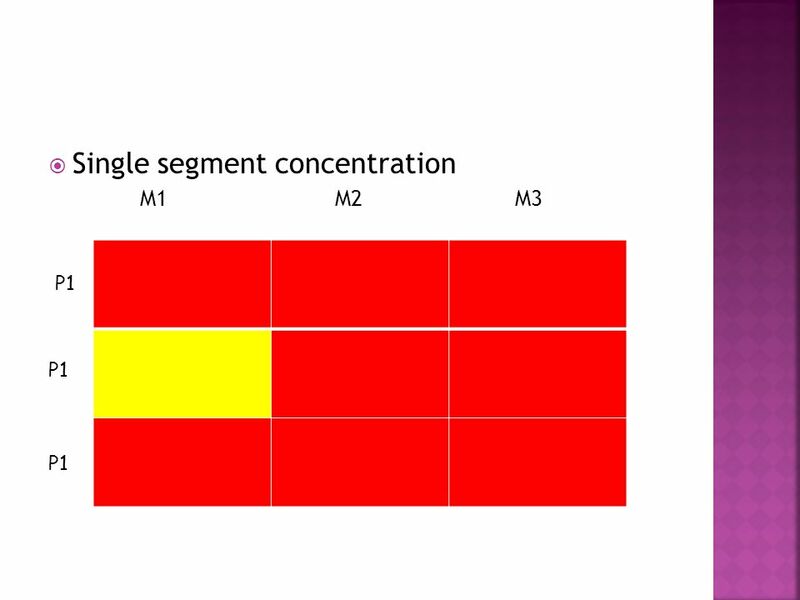 Identified by dividing segments into sub segments Example : heavy smokers includes two niches : trying to stop and who do not care. 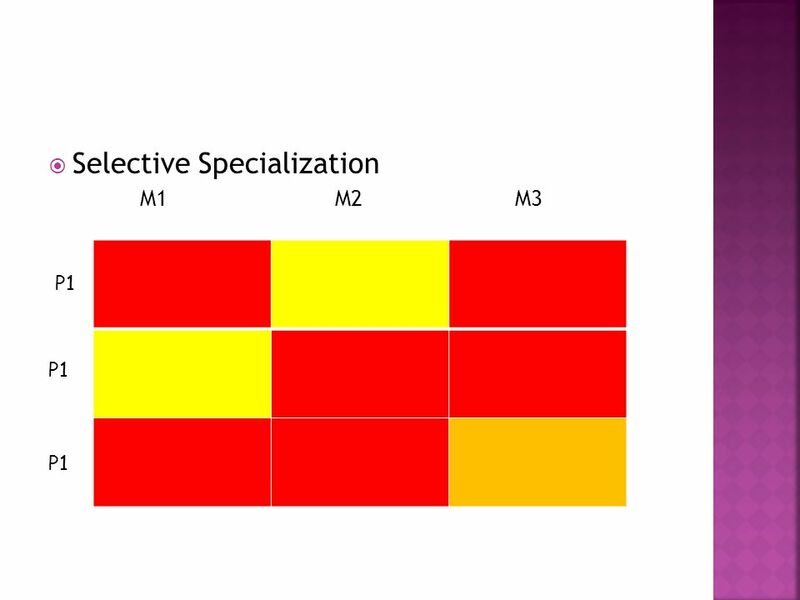 Characterization of attractive niche 1) Have a distinctive of needs 2) Pay a premium 3) Has size, profit and growth potential 4) Gains certain economies through specialization. 6 3. Local Marketing Target marketing is leading to marketing programs tailored to the needs and wants of local customer groups. Citibank provide different mixes of banking services in its branches, depending on neighborhood or demographics. Pro: see national advertising as wasteful because it fails to local needs Contra : It drives up manufacturing and marketing cost by reducing economics of scale. 7 4. 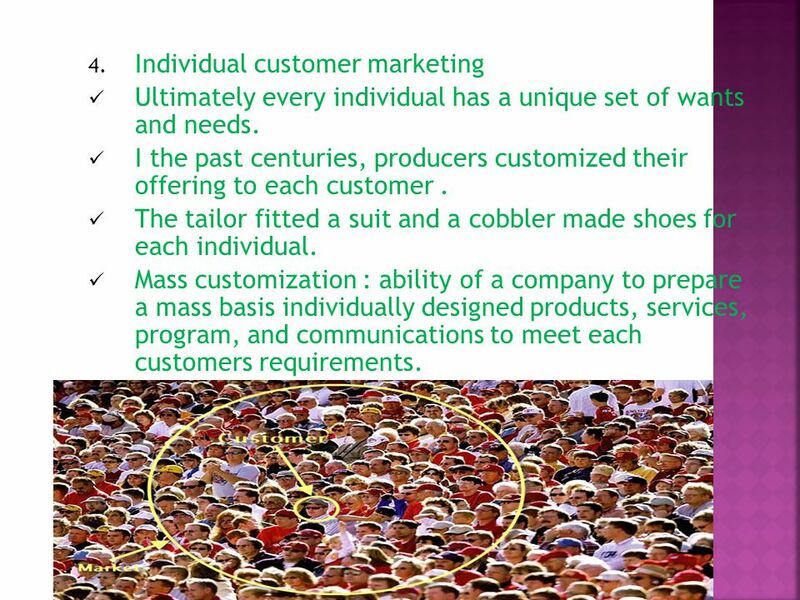 Individual customer marketing Ultimately every individual has a unique set of wants and needs. I the past centuries, producers customized their offering to each customer. The tailor fitted a suit and a cobbler made shoes for each individual. 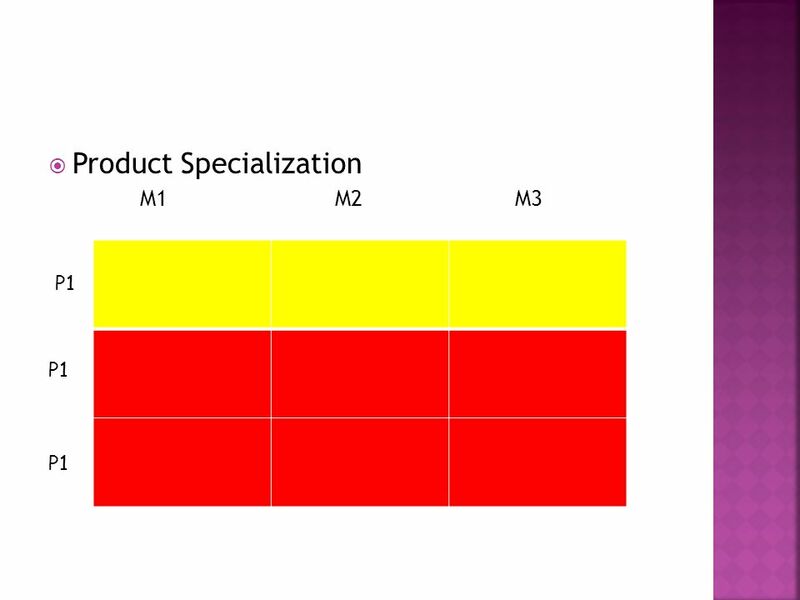 Mass customization : ability of a company to prepare a mass basis individually designed products, services, program, and communications to meet each customers requirements. 10 3. 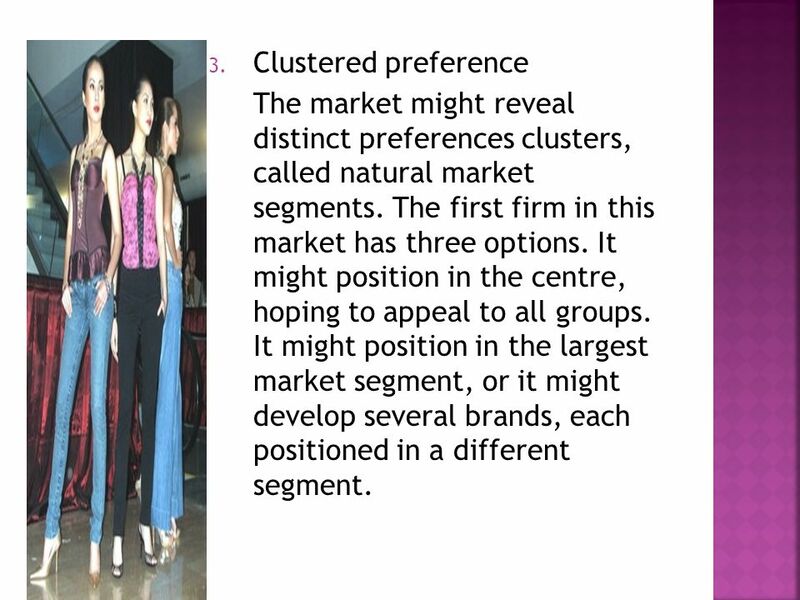 Clustered preference The market might reveal distinct preferences clusters, called natural market segments. 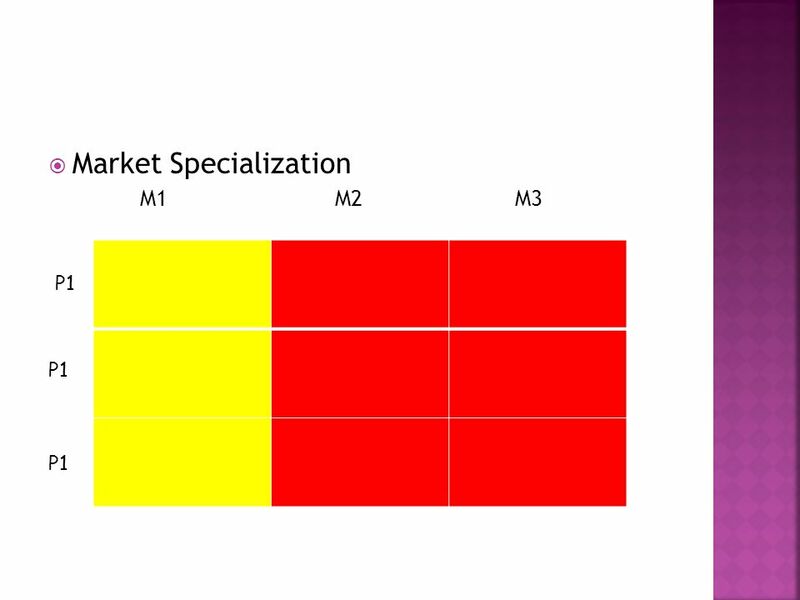 The first firm in this market has three options. It might position in the centre, hoping to appeal to all groups. 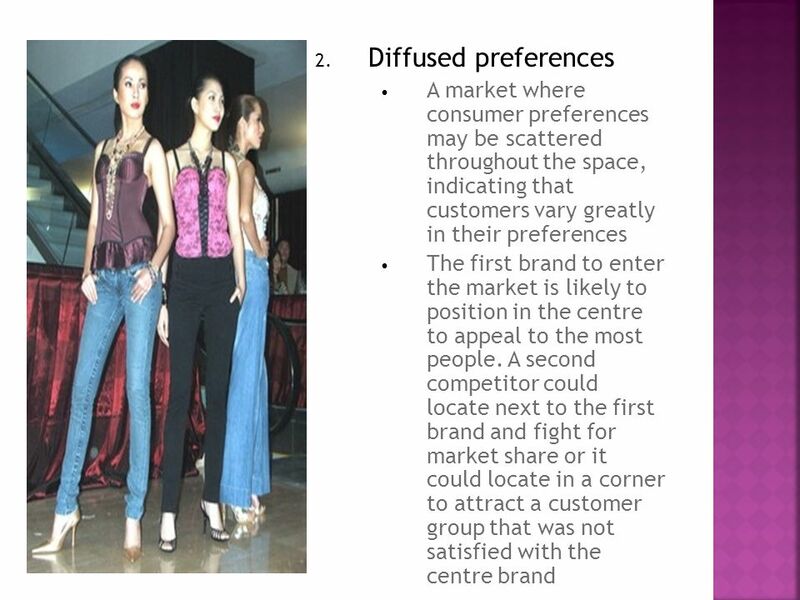 It might position in the largest market segment, or it might develop several brands, each positioned in a different segment. 11 1. 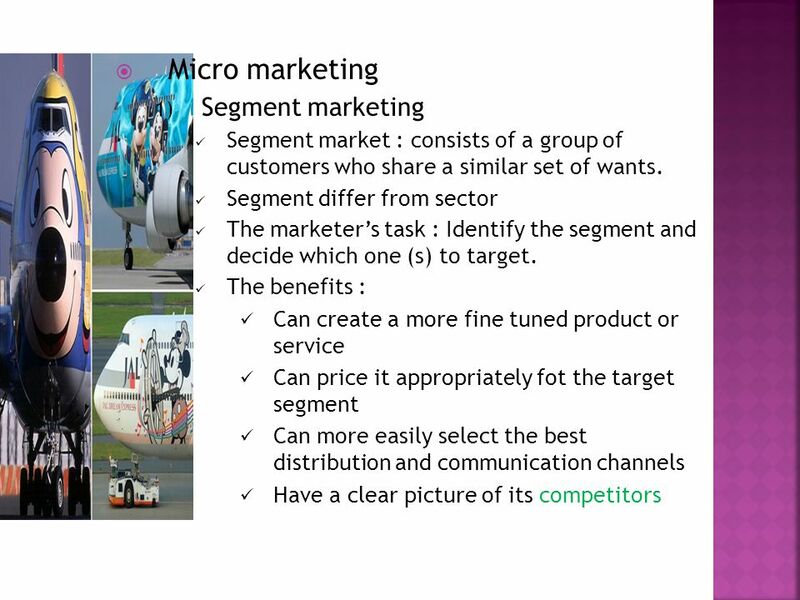 Needs Based Segmentation group customers in to segments based on similar needs and benefits sought by customer. 2. 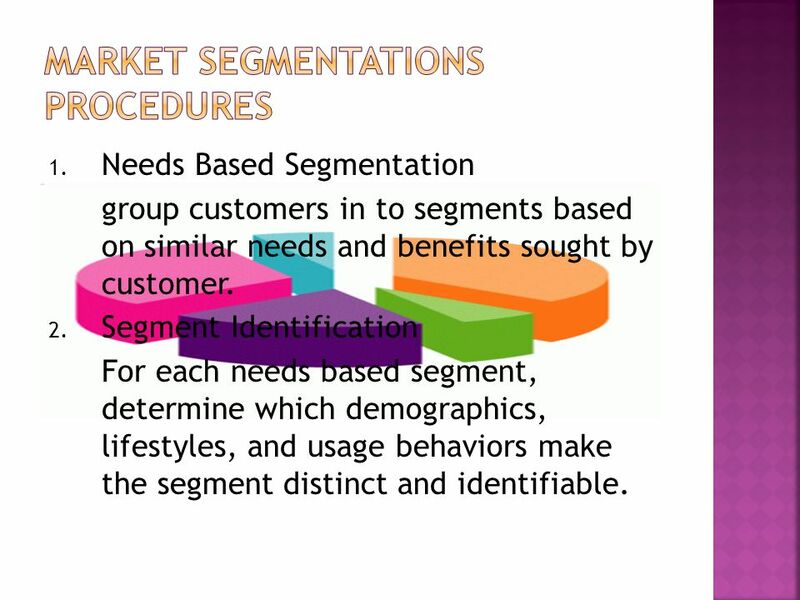 Segment Identification For each needs based segment, determine which demographics, lifestyles, and usage behaviors make the segment distinct and identifiable. 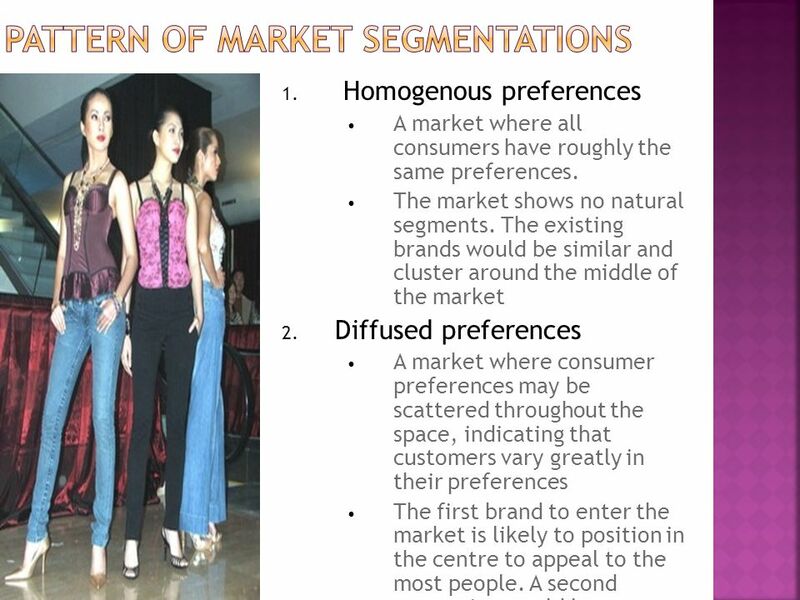 14  Basis for segmenting consumer markets  geographic segmentation Dividing the market into different geographical unit such as nations, state, regions, counties, cities, or neighborhood  Demographic segmentation The market is divided into groups on the basis of variable such as : age, famili size, famili life cycle, gender, income, occupation, education, religion, generation, nationality, social class, etc. 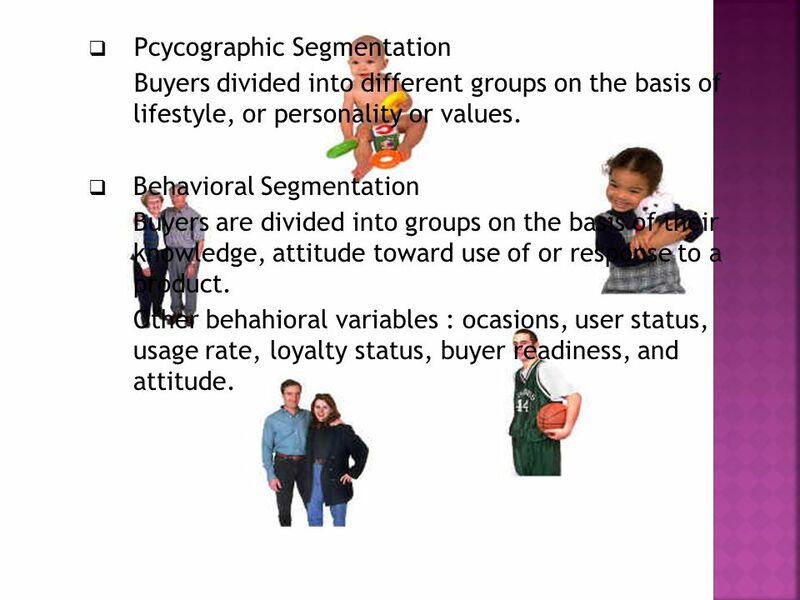 15  Pcycographic Segmentation Buyers divided into different groups on the basis of lifestyle, or personality or values. 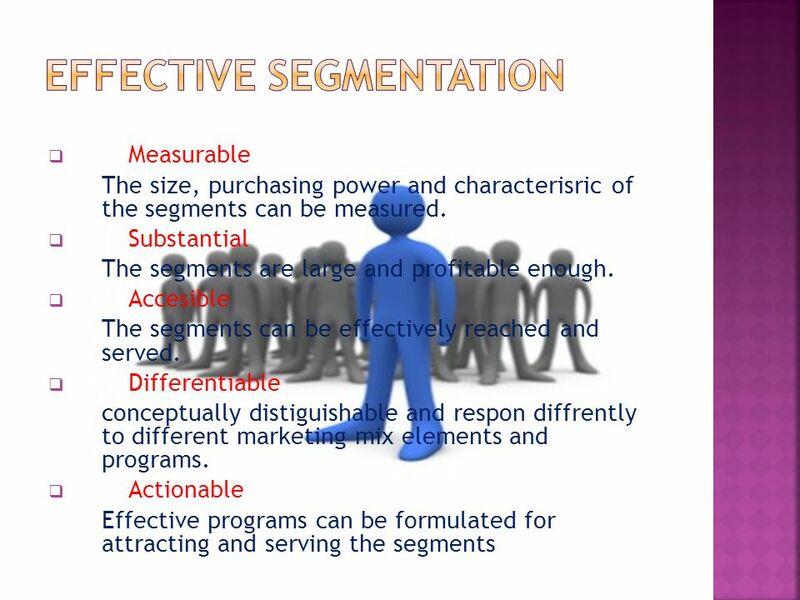  Behavioral Segmentation Buyers are divided into groups on the basis of their knowledge, attitude toward use of or response to a product. Other behahioral variables : ocasions, user status, usage rate, loyalty status, buyer readiness, and attitude. 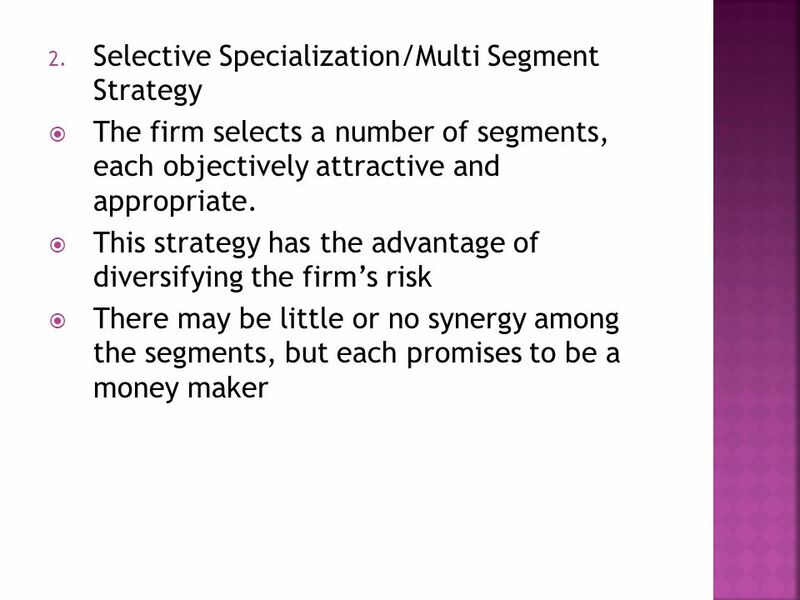 16  Once the firm has identified its market segment opportunities, it has to decide how many and which ones to target. 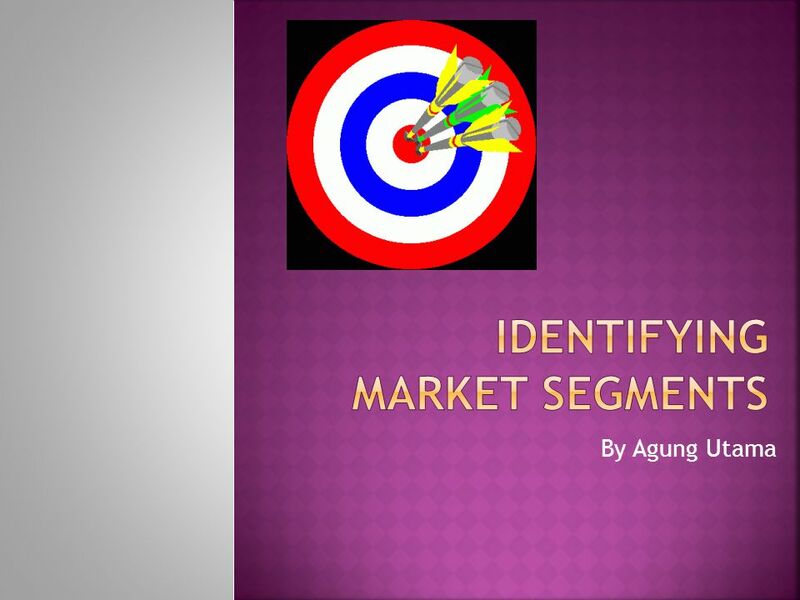  Market targeting related to select one or more market segments to enter. 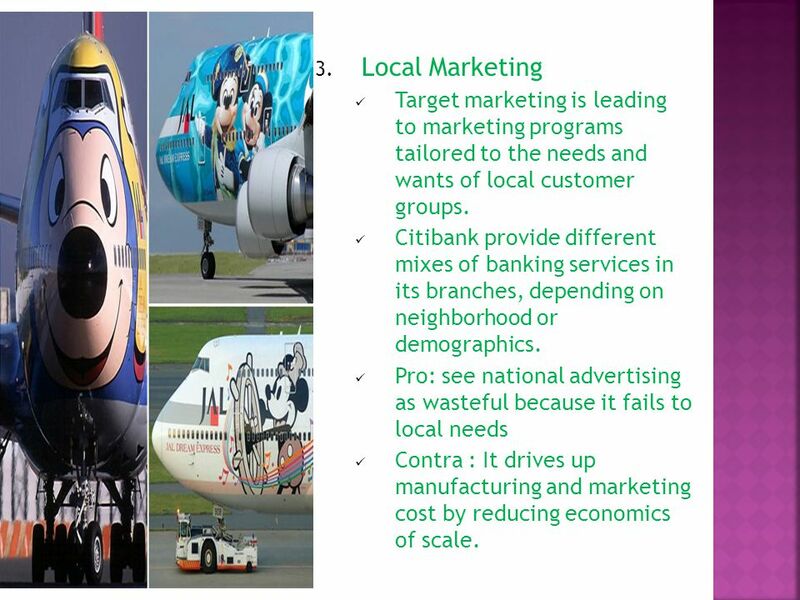  Five patterns of target market selection: 1. 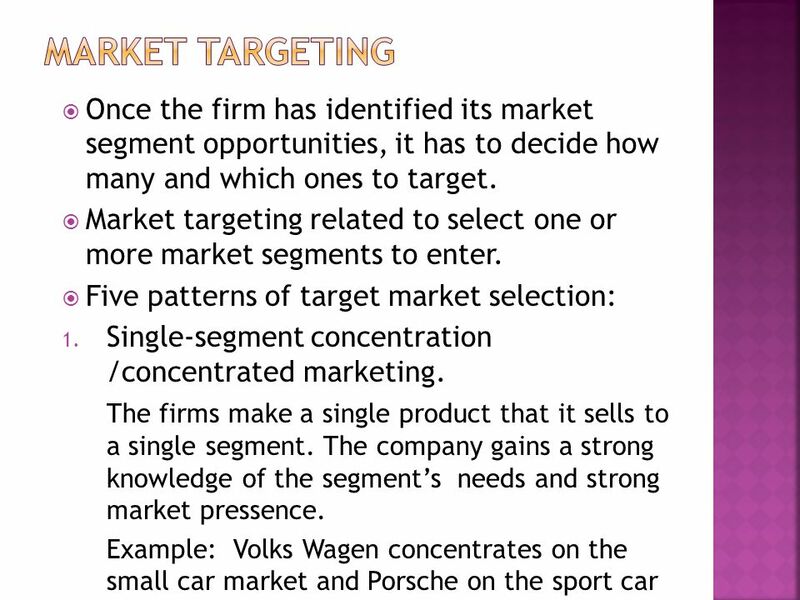 Single-segment concentration /concentrated marketing. The firms make a single product that it sells to a single segment. The company gains a strong knowledge of the segment’s needs and strong market pressence. Example: Volks Wagen concentrates on the small car market and Porsche on the sport car market. 20 3. 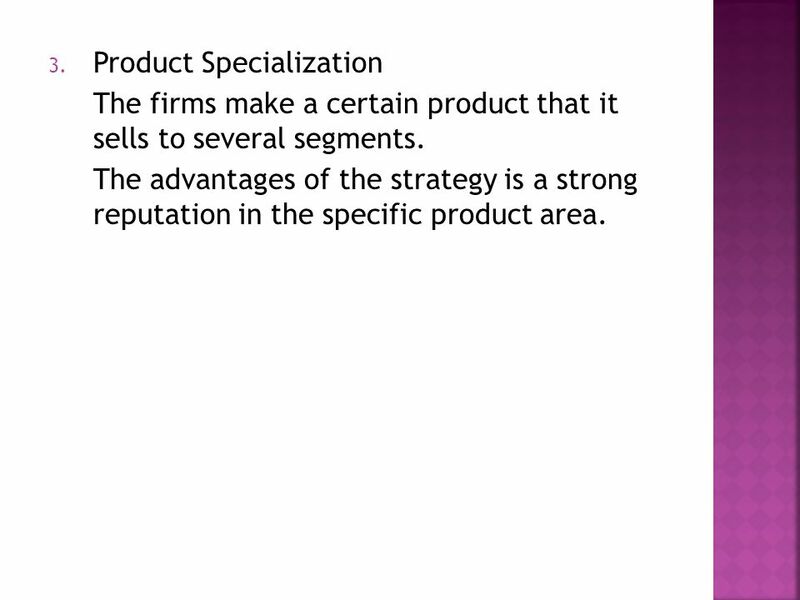 Product Specialization The firms make a certain product that it sells to several segments. The advantages of the strategy is a strong reputation in the specific product area. 22 4. 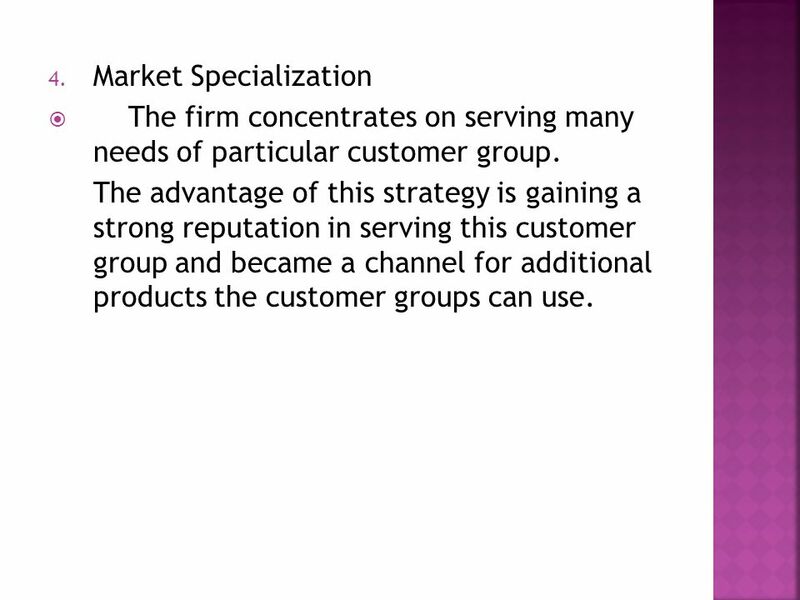 Market Specialization  The firm concentrates on serving many needs of particular customer group. The advantage of this strategy is gaining a strong reputation in serving this customer group and became a channel for additional products the customer groups can use. 24 5. 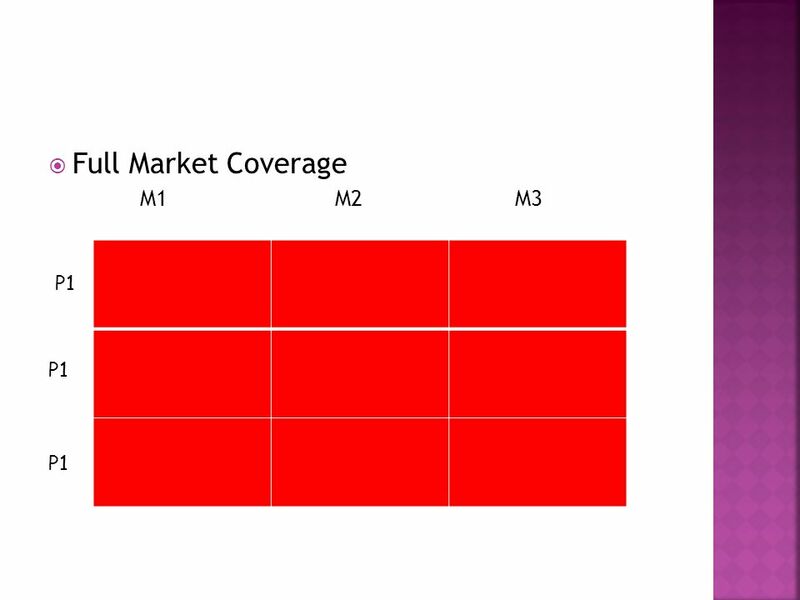 Full Market Coverage  The firms attempts to serve all customer groups with all the products they might need. 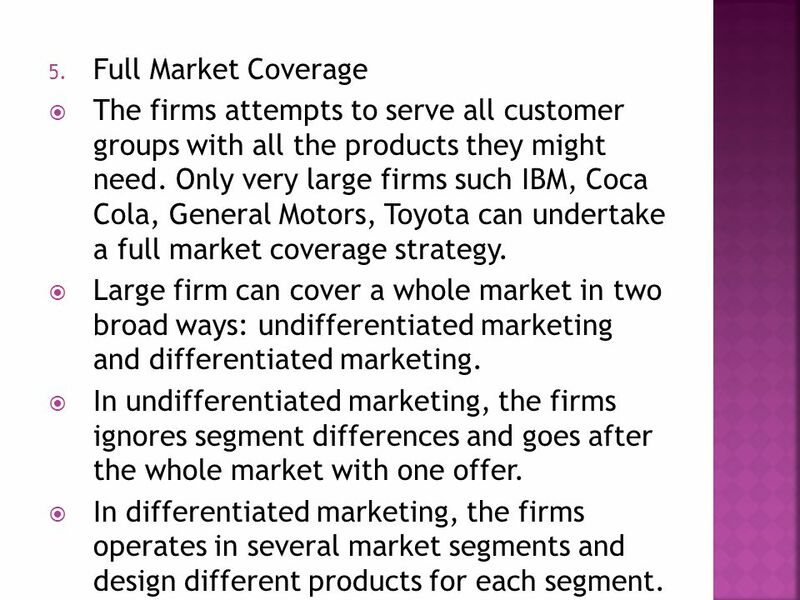 Only very large firms such IBM, Coca Cola, General Motors, Toyota can undertake a full market coverage strategy.  Large firm can cover a whole market in two broad ways: undifferentiated marketing and differentiated marketing. 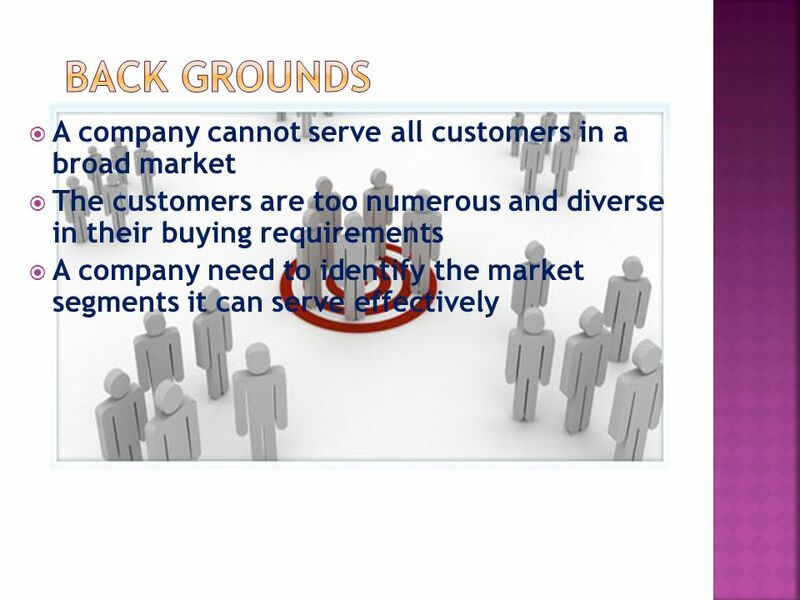  In undifferentiated marketing, the firms ignores segment differences and goes after the whole market with one offer.  In differentiated marketing, the firms operates in several market segments and design different products for each segment. Download ppt "By Agung Utama.  A company cannot serve all customers in a broad market  The customers are too numerous and diverse in their buying requirements  A." Objectives Be able to define the three steps of target marketing: market segmentation, target marketing, and market positioning. Understand the major. 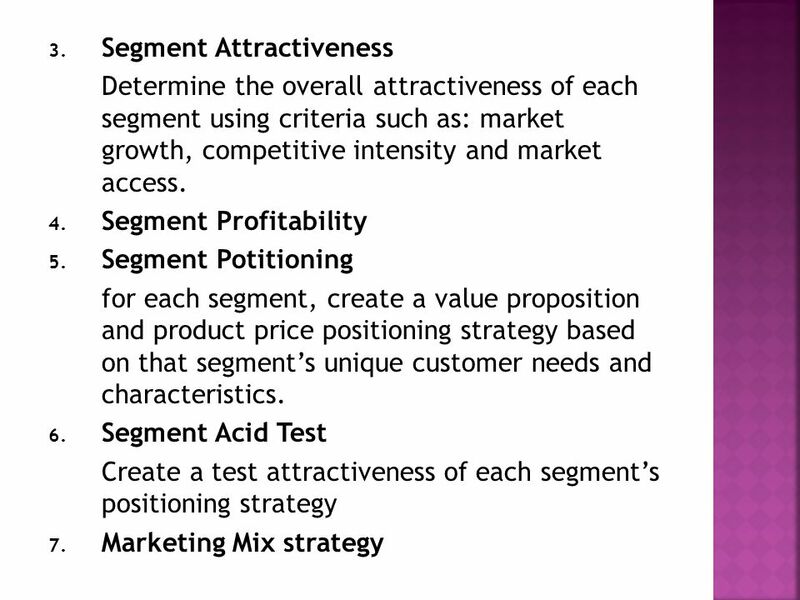 Copyright 2009, Prentice-Hall, Inc.7-1 A Framework for Marketing Management Chapter 7 Identifying Market Segments and Targets.